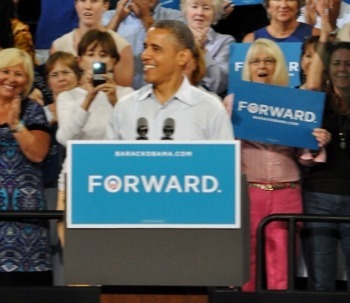 MELBOURNE, Florida -- Back-dropped by a stage audience where women outnumbered men 2 to 1, President Barack Obama delivered a speech at the Florida Institute of Technology campus in Melbourne, Florida today where he made no new promises for the U.S. Space Program. Instead, the President rested on the laurels of the landing of the NASA Curiosity Rover on Mars. The President reinforced his campaign theme of 'Moving Forward', saying that "our values are not Republican or Democratic, but American values." Obama tried talking football, and referenced the Chicago Bears, which fell flat on the audience. After feeling little love, Obama said, "Well, let me move on to another topic then." Obama then referred to Bill Clinton's speech during the Democratic National Convention in Charlotte, North Carolina. Obama used his previously-aired line that "Somebody should make him [Clinton] the secretary of splainin' stuff" which also fell flat from the audience. Obama said that there is a simple idea. That here in America, "Hard work will pay off and responsibility will be rewarded from Wall Street to Main Street to Washington, D.C." and that is why he ran for President. Obama talked about Floridian economic woes, saying "too many people rack up debt to pay their mortgages, tuition, and puttin gas in the car... Innocent Americans have lost their jobs and savings." As for Mitt Romney, Obama said that the Republicans said a lot about what's wrong with American, but, "They didn't have much to say how to make it right. They want your vote, but they wont tell your their plan. Their plan is tax cuts, tax cuts, and more tax cuts. Tax cuts to help you lose weight. Tax cuts to improve your love life... I promised I would gut taxes for middle class families, and i did." Obama started to specifically address the Florida's Space Coast economy by saying, "Here on Space Coast, a new era of American exploration has begun that has started new jobs. [Possibly referring to SpaceX]"
Obama said that he would "Change the tax code to reward companies who keep research & development and manufacturing here in the USA." Obama did not specify whether he was willing to allow the U.S. to violate the World Trade Organizations General Agreement on Tarriffs and Trade (GATT) that expressly prohibits such a tax code to accomplish that goal. Obama also touted that he has made it easier for foreigners to obtain visas to visit Florida, a policy he proudly announced at Disney World back in January of this year. Obama said that when it came to education, he "took on the system" to send the money directly to students instead of banks. However, he did not address why the U.S. is paying banks $2 for every $1 collected in defaulted student loans. Obama also said that his philosophy, like that four years ago, is to "Grow the economy - not from the top down, but from the middle out - the bottom up."